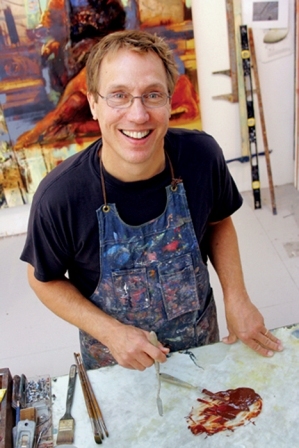 Bruce Herman is a painter, and Professor of Art at Gordon College, near Boston, where he is currently Lothlórien Distinguished Chair in the Fine Arts. Herman’s artwork has been exhibited in over seventy-five exhibitions in major cities in the United States (Boston, New York, Chicago, L.A.) and abroad (England, Italy, Israel, and Japan). His work is housed in many private and public collections including the Vatican Museums in Rome; Grunwald Center at Armand Hammer Collection, L.A. County Museum, Cincinnati Museum of Art, and the DeCordova Museum. I work mainly in oils, modified by the use of alkyd resins that speed drying time and allow a complex layering and indirect glazing technique. I do this in order to increase luminosity and complexity to the layers and to achieve a quality that mimics the passage of time – a crucial element in my imagery. As an undergrad I studied with several of the Boston Expressionists a group of older generation figurative-humanist painters influenced by Max Beckmann and Karl Zerbe, and many of whom were graduates of the School of the Museum of Fine Arts, Boston. My chosen models from ancient art history are largely from the Italian School (Piero, Fra Angelico, Giotto) regarding content and vision, and northern painters like Rembrandt as far as handling of the human form. During graduate school my advisor Philip Guston and Californian painter Richard Diebenkorn had a decisive impact on my work. I currently draw inspiration from my students and friends and colleagues, and would credit the following Christian artists as primary dialogue partners and influences: Ted and Cathy Prescott, Tanja Butler, Ed Knippers, Joel Sheesley, Jerome Witkin, Erica Grimm-Vance, Tim Lowly, Mary McCleary, Wayne Forte, Makoto Fujimura, Anthony Falcetta, Bryn Gillette, Amy Garofano, Angela Yarian. Several friends who are art historians or theologians have had a significant impact on my thinking and understanding of what I do as an artist: Calvin Seerveld, Jeremy Begbie, John Walford, James Romaine, Rachel Hostetter Smith, David Goa, Bill Dyrness. Finally I would like to thank my patrons and supporters – all of whom have had a very large influence on both my art and my thinking. In particular I owe a debt of love and gratitude to Walter and Darlene Hansen and to Patricia Jones for their unflagging support and insight. Making art is not simply a life-work, it is part and parcel of how I understand who I am in God’s creation. Simply put, I have never thought of my art as separate from my faith – from earliest childhood to the present. Though I have not always had a well-defined Christian faith, and have not always been a skilled or mature artist – I have always understood my art as an outgrowth of my love of God and God’s world of wonders. When asked how I see my faith affecting my art I am puzzled: the real question would be in what way, if any, does my faith not affect my art (and vice versa). The answer is that I have no way to disentangle these intertwined realities. They are one and the same impulse. Without wishing in any way to sidestep the request to interpret my work, I must say that my interpretation is only one of many – in all likelihood nearly as many as there are responsive viewers. I firmly believe that genuine artists are “carriers” of art, not originators of art and therefore often barely understand the full content of their own work. I believe that I am a servant of the artwork – not its master. All that said, I will share the following thoughts: For five of the last six years I have focused almost exclusively on a large mural project dealing with the life of the Virgin Mary – her relationship to God, to her son Messiah, and to us – being a representative of the church universal. While completing that larger project, I began another related series of paintings on the stages of a woman’s life – childhood, young adult, married, and mature – and in most instances employed my wife and daughter as models for both the form and the content of the paintings. In one instance I had the model for the Virgin Mary, Elisa Lardani, pose for the married woman image entitled “Called”. I had a pastor friend’s young daughter pose for the childhood image entitled “Girl”. 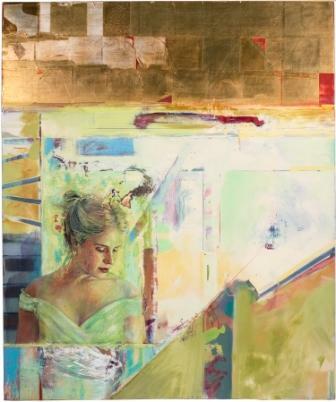 In all of the Woman paintings there is an attempt to evoke the complexity and richness and unique strength of a woman – intellectually, emotionally, spiritually. Palazzo dei Sette, Orvieto, Italy; Alva deMars Megan Art Center, St.